Nina Garcia continues to overhaul US ELLE and following a beautiful Kendall Jenner cover last month, the editor-in-chief wastes no time getting the big names to front the magazine by securing Nicki Minaj for the July 2018 issue. “Reclaiming her throne” in the music industry and on the cover of ELLE, Minaj was photographed by Karl Lagerfeld in his Paris-based studio. 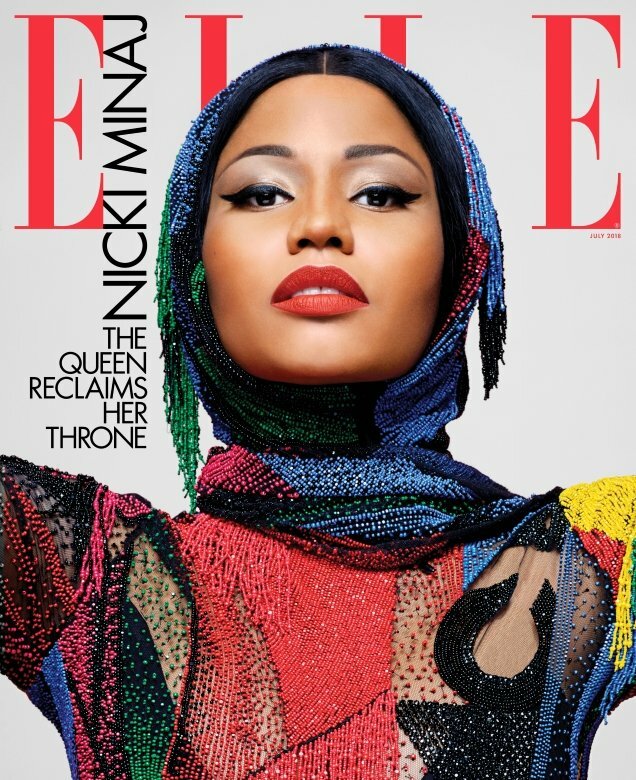 In the vibrant newsstand cover image (below), Nicki wears a colorful embellished Versace number and is even joined by The Kaiser himself throughout the accompanying cover story. Not only has Minaj received Lagerfeld’s endorsement, but she also gets the seal of approval from (the majority of) our forum members this month. “Wow, striking! This will definitely draw attention at the newsstands. The lightly softened look and faint smile looks refreshing. Don’t listen to her music, but one can’t deny she’s rather beautiful and ELLE did her justice here!” exclaimed Benn98. “This really works, what a truly refreshing cover,” Miss Dalloway said. “Wow, I was expecting something really bad but Karl surprised me with this one. I like it!” Scotty added. “Very retro cover, I love it,” Wintergreen agreed. “Surprisingly simple but effective,” shared lelaid. Of course, the cover didn’t cater to everyone’s taste. “Can’t think of a worse combination. That picture of Minaj and Karl is probably the epitome of everything I find aesthetically repulsive in fashion. It’s like they are lifeless. I can’t see that the trend surgically constructed women shows no signs of abating,” fumed Les_Sucettes. Check out the rest of Nicki’s cover story and join the conversation here.